Holidays in assisted living & memory care communities can still be fun, festive, and meaningful even if it means embracing new traditions. The holidays are about spending quality time with people you care about. 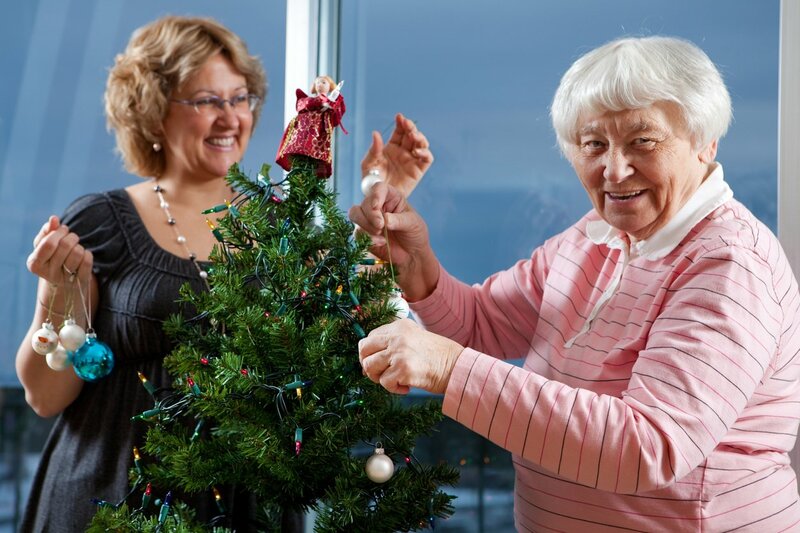 Older adults in assisted living will feel loved and included when you find ways to bring the holiday spirit to them. Remind yourself that what’s most important is celebrating together in a way that works for the current situation. To help you find ways to celebrate, we’ve outlined answers to three typical questions that can arise. Should I bring mom home to celebrate with the rest of the family? 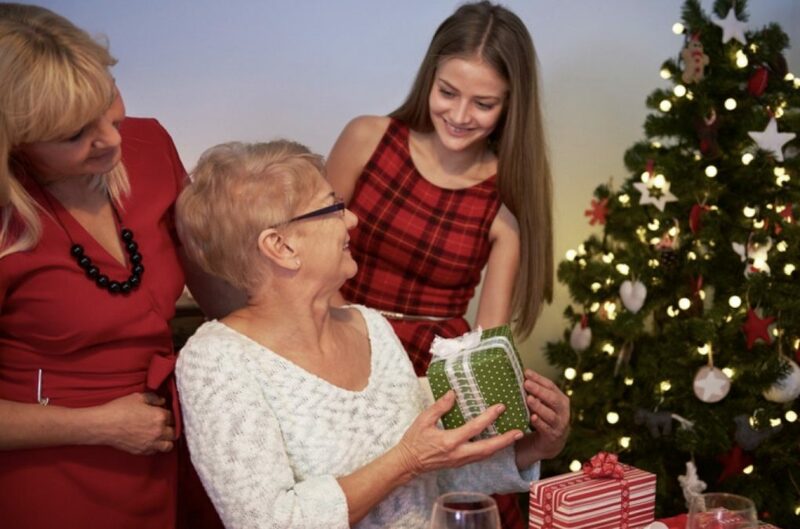 If mom doesn’t have dementia and you can handle her physical needs and transportation, going to the family home would be a great way to celebrate the holidays. Before deciding, talk with her to see how she feels about it. She may be concerned about getting too tired or needing help with personal care. Reassure her by explaining how her needs can be met. If she’s feeling shy or afraid that she’ll be a burden during a fun time, remind her of how much the family is looking forward to seeing her. If your mom does have Alzheimer’s, dementia, or other cognitive impairments, it may be disorienting to take her out of a familiar environment. Staff members who know her well may help you decide what would work best. Some people with dementia enjoy festive events, but others are easily rattled by changes in routine, loud noises, or crowds. If your mom is likely to get agitated, it might be better to have a quiet mini-celebration in her room or just have a regular visit. My dad has dementia. This year, he doesn’t even seem to know that it’s the holidays. Will he even know or care if we celebrate with him? Even if your dad doesn’t seem engaged with the world, he’ll still enjoy spending time with you and family. You may or may not want to take him out of assisted living, depending on how well he usually does with outings. If he typically enjoys going out, then it may be a good idea. If not, turn the visit into a festive occasion if that’s likely to bring him joy. It’s a perfect time to reminisce over old photos, sing along or listen to holiday music, or admire cheerful decorations. Unless he becomes agitated or upset by activities or change in routine, seeing you in the holiday spirit will likely brighten his day. What activities can I do to celebrate the holidays with someone in memory care? If your loved one has dementia, a low-key approach to the holidays may work better. Overstimulating holiday activities or busy decorations could be confusing or cause agitation. Start with a few simple decorations and smaller groups of visitors and see how things go. You can always add more or take some away, depending on the reaction. For seniors with cognitive impairment, find creative ways to help them take part in family celebrations. Reassure your older adult that they won’t be forgotten or abandoned by telling them when you’ll celebrate with them. Help them think of and purchase gifts for kids and grandkids and wrap them together. In a recent study conducted by the National Alliance of Caregiving in collaboration with AARP, 15 percent of the estimated 34 million Americans who provide care to older family members live an hour or more away from their care recipient. This means that a significant number of caregivers rely on regular telephone conversations and check-ins by other closer-living relatives to gauge an aging loved one’s well-being. Unfortunately, age-related decline can happen quickly, and in many cases, seniors are skilled at concealing new and worsening problems. For many of these families, holiday visits are the only opportunity for them to observe their loved one in person, so it’s important to pay close attention to their physical and mental health and their living situation. During this year’s holiday gatherings, be sure to look for the following warning signs that a loved one may need some extra help. One of the most obvious signs of ill health, either physical or mental, is weight loss. Possible causes could be cancer, dementia, or depression. Seniors may also experience reduced energy, which can make it challenging to shop for and prepare a nutritious meal as well as clean up afterwards. Furthermore, all this effort can seem especially unnecessary if they live and eat alone. Certain medications and aging in general can also change the way food tastes. If weight loss is evident, talk to your loved one about your concerns and schedule a doctor’s visit to address the issue. Pay close attention to the way your loved one moves and how they walk. A reluctance to walk, changes in gait or obvious pain during movement can be a sign of joint, muscle, or neurological problems. If your loved one is unsteady on their feet, they may be at risk of falling, which can cause severe injury or worse. If you notice changes in their mobility and coordination, make an appointment with their doctor to discuss options to keep them safe and mobile, such as pain management, physical therapy, and mobility aids. Keep an eye out for changes in your loved one’s moods and behavior. You can’t always gauge someone’s emotional state over the telephone, even if you speak on a daily basis. Look for signs of anxiety, including withdrawal from social activities, changes in sleep patterns, loss of interest in hobbies, and changes in basic home maintenance and personal hygiene. The latter can be an indicator of dementia or other physical ailments like dehydration, which often happens to elders in the winter months and can be serious. If you notice sudden odd behavior in your loved one, such as confusion or agitation, be sure to seek medical attention. These are common symptoms of a urinary tract infection (UTI), which is prevalent in seniors and easily resolved with antibiotics. Attention must also be paid to a senior’s surroundings. For instance, if your loved one has always been a stickler for neatness and paying bills promptly, but you discover excess clutter and piles of unopened mail while visiting, it indicates a problem. Take a walk-through of their home while you’re visiting to see if they are keeping their house to the usual standards. Be aware that sometimes the signs of trouble are a bit more subtle. Scorched cookware could indicate that your loved one forgets food on the stove or in the oven, and an overflowing clothes hamper could mean they don’t have the strength and/or desire to do laundry. Be sure to check the expiration dates on their prescriptions and over-the-counter medications. Also make sure they’re taking their medications as prescribed. You know your loved one and their habits best, so go with your gut if something seems off. While you may want to keep things light during the holiday season, do take this opportunity to address any red flags you observe. Collect any necessary information while you are in town to avoid any added frustration and confusion in the event of a crisis down the road. First, have a heart-to-heart conversation with your loved one about their present circumstances and any concerns you may have. Suggest making an appointment with their primary care physician for a complete health assessment. The results of this evaluation will help you both determine what the next possible steps are may be necessary to keep your loved one safe, happy, and healthy. If possible, visit your local Department of Aging office. In the Eau Claire area, this would be the Aging & Disability Resource Center (ADRC). Their office is located in the Eau Claire County Courthouse complex in Eau Claire. They are an excellent contact for information on resources and services available in the area. While it may be more difficult to arrange a face-to-face meeting with one of their Options Counselors during the holidays, it is still worth reaching out or leaving a message by phone at either: 715-839-4735 or 888-338-4636. You can also visit their website at: https://www.co.eau-claire.wi.us/departments/departments-a-k/aging-disability-resource-center to research the services they offer. Sit down with your loved one to create a current list of people they interact with on a regular basis. This list should include friends, neighbors, and clergy who you trust to keep an eye on your loved one and you can contact in the event of an emergency. Double-check their addresses, telephone numbers, and email addresses, and…be sure to share your own contact information with them. Now is the time to begin compiling a To-Do List that can be implemented over a period of future visits. There are three categories to this list: medical, financial, and legal. Medical: You’ll want to develop a complete medical record for your loved one, including their health conditions, prescriptions, and their doctors’ names and contact information. This is extremely helpful for you to have on file, and your loved one can keep a condensed copy on hand for both routine appointments and medical emergencies. Have you arranged to have a health care Power of Attorney (POA)? Information regarding this document as it pertains to Wisconsin residents can be found at: https://www.dhs.wisconsin.gov/forms/advdirectives/f00085.pdf. Financial: A financial list should contain all of a loved one’s property ownership, debts, income, expenses, and bank account and credit card information. This list will help minimize confusion and ensure all their bills are paid on time. Legal: The legal aspect of this To-Do List is possibly the most important. There are vital documents that must be obtained to ensure you can access your loved one’s medical information, make health and financial decisions in case they become incapacitated and administer their estate. If they have not already done so, it is crucial for your loved one to meet with an attorney to draw up medical and financial power of attorney (POA) documents and a will. You should have access these documents and other important information, such as their social security number, Medicare information, insurance policies, the deed to their home (if applicable), and their driver’s license (if he/she is still driving). All of these preparations may seem excessive, but it is better to be over-prepared then caught off guard when a loved one’s care needs suddenly increase. Throughout this process, remember to empower them to control their own life as much as possible. You may receive some resistance, but remind your loved one that sharing this information and pursuing supportive resources will enable them to remain independent and safe in their own home and give you added peace of mind as you return home from your holiday visit. For many families, the upcoming holiday season is a time for coming together and a time for reflection. For adult children, these aspects of the season can often make for some tough situations. We may realize upon seeing our parents after a long absence that their health is not what it used to be. Realizing you need to come up with a strategy for caring for elderly parents is never an easy feat, but it is the first important step in facing a reality that nearly all of us will encounter as we ourselves get older. The role reversal that caring for aging parents imposes on us and our loved ones can be difficult. However, with the right outlook and the help of advice on caring for elderly parents, you can make the necessary adjustments a little bit easier on you and your family. When you’re first encountering this role reversal it can be, above all, strange for the parties on both sides. Some parents, having cared in different ways for you your whole life, may put up some resistance to this time of change. With this in mind, when your family is discussing caring for elderly parents, the most important thing might be to approach all conversations and conflicts with a heavy dose of patience. Every family is different, and the amount of difficulty involved in stepping up your role in caring for aging parents can vary widely. You should consider the situation for what it is…a process, not a single moment. With patience and perseverance, you can find the best solution for taking care of your parents based on their individual needs. Every process of course has a starting point. And when it comes to caring for aging parents, this process needs to start with a realistic, group conversation that involves your family members and seeks input from both children and parents. Another source of tension in caring for elderly parents can be the process of sorting out the roles of different siblings. While it may be stressful, it is important to involve everyone. In the end, the degree of commitment in caring for aging parents may vary from sibling to sibling. However, without involving them in the conversation, you will never know how they feel about the situation. As hard as it may be to discuss certain things, using this time of year when your family may all get together in one place can be much easier than when you have all gone back to your busy lives. Your family does not have to make this decision on its own, of course. Consider connecting with experts in your community and seek out their advice. Talk to your parent’s physician, staff at a local senior living community, an elder care attorney, as well as friends who have been in this situation before. Take in all this advice that you can about possible care options, so that you can be sure your family arrives at the right, well-informed decision for your parent(s). By beginning with a level-headed conversation during this season, you can start down the road towards caring for your elderly parents to the best of your ability. Based on your parents’ individual health, consider their options for senior living and care — including all willing parties that you can this holiday season. With the right, patient approach, you can help ensure the best outcome for all involved. The holidays are traditionally a time of year when families get together to celebrate. In many cases, when loved ones are disbursed across the country, this is often the first time all year when the family is reunited. For adult children returning home to visit a senior loved one, the changes they see in their family member’s appearance can sometimes be shocking. They may be unprepared for how much an aging parent has been struggling. Even when families talk on the phone several times a week, an aging parent may be unwilling to open up about the problems they are experiencing. It’s not unusual for us to talk with panicked families throughout the holiday season who are in a frantic search to find a senior living community while they are home. Even at that, many families are reluctant to discuss the issue or bring their loved one(s) by for a visit during the holidays. Surprisingly, the holidays can be an ideal time to visit a senior living community like The Classic. 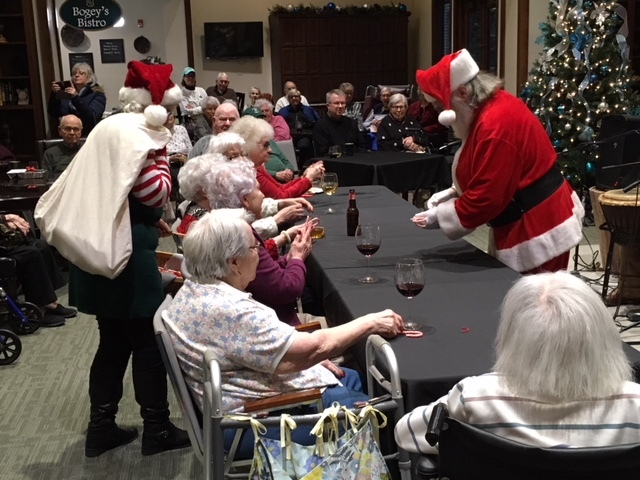 From the festive décor, the jam-packed schedule of events, the holiday season in a senior living community is very lively! Why Visit The Classic During the Holidays? While adult children may feel like the holidays are a terrible time of the year to talk about moving to a senior living community, the opposite might actually be true. Below are a few reasons you should consider touring The Classic when you visit your senior loved one this holiday season. Family Input: Because families are often together during the holidays, it can be an ideal time to discuss senior care options and to visit communities together. Enjoy the Festivities: The Classic is especially lively and festive during the holidays. Youth groups visit to entertain, school choirs perform, and the halls are decked! The whole spirit of our community can be very appealing to a senior who may be feeling isolated living alone at home. Beat the Rush: January is often a very popular month for families to visit and tour senior living communities. You can beat the rush by exploring your options and… if The Classic is deemed as your loved one’s destination, getting your deposit in and getting on our wait list will guarantee that you will get a call from us sooner when a unit becomes available. Wondering how to start the conversation with an aging parent about a sensitive topic? Whether you need to talk about moving to a senior living community, giving up driving, or bringing in help, knowing which words to use — and to avoid — can improve the odds of moving towards a solution. those who tend to be more self-conscious or private and don’t welcome these kinds of discussions and may even find it somewhat insulting. You should also be fully aware that even if in the past, your parent was sharing and receptive, this can change due to aging-related issues like depression, creeping dementia, lowered self-esteem, or other frustrations. On the other hand, a close-lipped parent may be relieved to talk because he or she is worried as well. What to say about sensitive subjects can also be tricky because both parties typically have different goals. Adult children want to solve the problem and move on. Their parents, however, want foremost to maintain a sense of control and dignity in a time of their life that can be marked by many losses. Your goal in how to have “the talk”: Balance both sides’ needs by moving forward slowly and with care. Before you say a word, take some time to collect information and research possible solutions. Ultimately, the goal is to problem-solve together through a dialogue with your parent rather than trying to dictate the solution or attempt to convince through arguments. If you gather facts first, you’ll be able to help in a way that’s better informed and less stressful for everyone. Observe what specific kinds of limitations you’re seeing. Trouble climbing stairs? Cooking? Managing finances? Grooming? Thinking in terms of specifics helps you to figure out the best solutions, as well as accurately describe any concerns to any outside resources — and to your parent. Make it a point to personally observe your parent drive while looking for potential signs of unsafe driving. Research alternate transportation services in your parent’s area or explore other ways he or she might get around without a personal auto. Closely observes what activities your parent are having trouble with. Look around the house for concrete signs that he or she may not be doing well living independently. Start to research sources of in-home care help and associated costs. Check out a few places on your own so you have concrete examples to talk about. If you live a long distance away, read reviews about various options and if possible, make an appointment to tour them when you’re there. Don’t think of it as being “sneaky,” as it can actually be less anxiety-provoking for your parent if you present them with options you’ve already checked out. And…you can also make them feel empowered by going through the whole list of choices together if he or she prefers. Before you start the conversation, take time to get a sense of whether your parent is open to it. You can do this by first introducing an unthreatening related topic. This can be done by phone before a visit, or if you see your parent often, in a separate visit. This isn’t yet the time for hot-button topics, criticism, or anything contentious. Keep things positive and generalized. Does he or she respond openly? Defensively? Evasively? This will give you the important insight into how to proceed. Even if in a “test-the-waters” chat, your parent sounds receptive to discussing a tough issue, it’s usually best not to plunge in yet. In this first talk, you should be looking to simply float the issue, not problem-solve. You want to show in a respectful way that you can be a helpful, non-judgmental resource. What if your parent resists any talk about his or her future? Pause to consider whether this conversation is best had by another person. A neutral third-party such as a doctor, family friend, clergy can perhaps be better suited to bring up tricky topics like driving or whether to continue living independently. These people can lay the same groundwork, explaining what seems to be wrong and suggesting options for fixing it, without risking a strained relationship in the way an adult child does when a parent is especially resistant or feels manipulated. Set the Right Tone So you’ve done some homework and have a sense of how ready (or indifferent) your parent is. How do you take the plunge? Plan to start the conversation on a different day from your test-the-waters chat. This conversation should be done in person if at all possible as it feels less threatening or overbearing, and more natural. Make sure you are not critical the minute you walk in the door. Focus on connecting and having fun while also using some time to observe. While you may be on a mission to resolve the problem, you’ll have a more ready audience if you first take the time to enjoy one another’s company before diving in. Look for an Opening The best time to segue into a serious conversation is when your parent brings it up first and asks for your help. If that fails to occur, look for an opportunity when everyone is relaxed. Then take the plunge and describe what you’re seeing. Use reflexive listening — an effective communication technique for difficult conversations. Rephrase what your parent says, as a way of playing back that you understand — making your parent feel supported — and then move the conversation forward. Find ways to be reassuring. Talk up the positives or stress how the solution is good for everyone. To help with resistance, focus on the solution. Or, look for the underlying cause. Some people push back for a specific unmentioned reason, which may be emotional, physical, or cognitive. Maybe Dad doesn’t want to talk about moving because he thinks he can’t afford it. Maybe Mom lacks the cognitive ability to realize she can’t live alone. If the person is very resistant, the most successful person to have the conversation is not usually the adult child. A family friend or physician may have better luck. The goal is to encourage more input and to keep the discussion positive and collaborative. If you want a parent to consider an assisted living option, one methodology is to casually drive by the best place you’ve identified through prior research and suggest dropping in together to have a look. Better yet, if you have a logical excuse, such as visiting a friend’s parent, stopping to see a “friend” who works there, or…participating in an activity or meal you’ve prearranged. Make sure it’s a place you’ve prescreened so that you’re fairly certain your parent will find things to like. Even if there is not much choice, lay out the options along with their pros and cons, strategize solutions to the biggest problems, and let your parent draw his or her own conclusion (assuming dementia is not an issue). Whatever you do, don’t launch an aggressive “sell” on your favorite option the minute you get back home or the next time you talk. And don’t push for making a decision right away. Try not to even hint or nag at first. Be Ready to Continue the Conversation at Any Time If your parent mentions the conversation at all, use this as a wedge to revisit the matter in a supportive way. Take this as a positive sign that he or she is at least aware of the issue and thinking about it. Go over the facts as well as the solutions again in a nonthreatening way. Total resistance means it’s time for a third party (not the adult child) to try. This conversation may need to be more direct. It may have include a discussion of the risks and the possibility that if they don’t voluntarily give something up, for instance, their driver’s license or residence, there is a risk that others will take over because of the dangers involved and that they may have less say in what comes next. They can be told it’s better to work on it voluntarily with someone who loves them and only wants to help them get what they need. If the issue is critical and the person still won’t make a safe choice, it may be time to get a family doctor and lawyer involved to evaluate competency and, if appropriate, activate a Power of Attorney (POA) or appoint a guardian who can make safe choices on the person’s behalf. If your parent is of sound mind but just making decisions that you disagree with (not endangering ones), all you can do is continue the conversation in a positive way. Any choices are ultimately his or hers. You may not like the choice, or you may end up needing to revisit the matter at a later date. What you can do is remain upbeat and supportive, even if you’re frustrated or worried. This keeps a welcome sounding board as your parent moves, however slowly, toward resolution. Remember that transitions involve an ongoing dialogue. Difficult as that first conversation about a sensitive topic is, it’s only the first of many you’re like to have as you strategize your way towards a solution that everyone can feel better about.